Paradigm People was a quarterly magazine for residents of Paradigm Housing, often including advice on money management. From October 2008 to July 2011, I was Media and Marketing Officer for Paradigm Housing Group, a housing association with close to 12,000 homes in south east England. I managed the project to put the magazine out to tender and create a fresh new look. We chose design agency Quercus Eight and put together an editorial panel of staff and residents. When the I arrived, the magazine had an approval rating of 50%. When I left in 2011, that had risen to 83%. 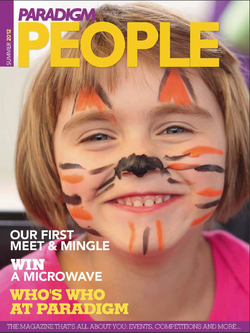 The magazine has been praised for delivering essential messages to the residents, while giving them opportunities to get involved and covering stories they look forward to reading. I continued to edit the magazine on a freelance basis until 2015.